Elevate your pizza game with this twist on a Friday night staple. Just seeing the word pizza elicits a visceral reaction. Suddenly we are flooded with memories of birthday parties and wine nights, and filled with a hunger that can only be satisfied through this doughy delicacy. 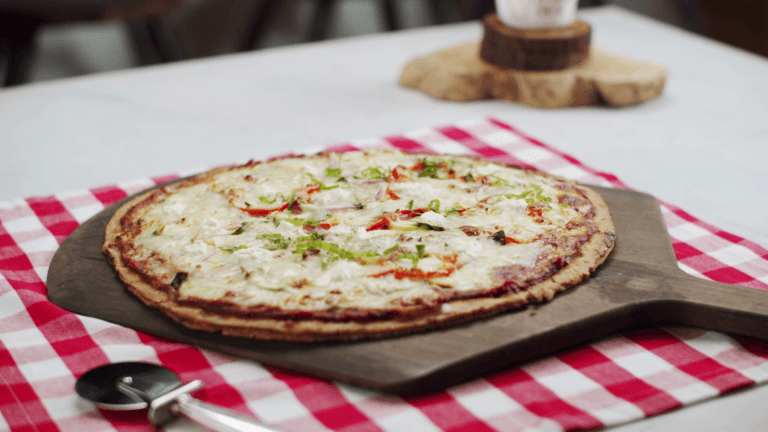 One could argue that there is no food more comforting than pizza, and this vegetable farmer cheese pizza is certainly no exception. Not only is this veggie pizza delicious (and a blast to make… date night? ), but it has some hidden health benefits from the added Skyr and farmer cheese. Skyr is an Icelandic cultured cheese that has a similar consistency and flavor of Greek yogurt, and is high in nutritional value. It also contains high levels of protein and calcium, as well as probiotic cultures, which can help to maintain a healthy gut microbiome, soothe anxiety and stress, and help with digestion. Farmer cheese is a soft, cultured cheese with similar health benefits and a tangier flavor. Use this delicious vegetable pizza as an excuse to get your friends together, and make a recipe that you can feel awesome about eating. Combine flour, garlic powder, and skyr on a cutting board or in a bowl. Mix with hands until a dough forms. Place the dough onto a lightly floured work surface and knead until the dough is smooth and slightly elastic, about 8 minutes, dust with more flour if sticky. Divide dough into a ball and split in half. Sprinkle the surface of dough with a little more flour and roll into two 10-inch pizzas. Place pizza dough on a non-stick baking sheet. Spread sauce over the dough. Add zucchini, yellow squash, red onion, red bell pepper, spinach, mozzarella and farmer cheese. Bake for approximately 10-14 minutes, until crust is brown and cheese is bubbly. Lifeway Foods is America’s favorite probiotic kefir company. Since 1986, Lifeway has been committed to creating great-tasting cultured and fermented foods to support the health of your microbiome. You can find Lifeway kefir, skyr, supplements, farmer cheese, non-dairy Plantiful, and ProBugs for kids at your local grocer and online.